The "it's mine" phase is difficult for most parents to handle, especially in front of other parents because many people still see it as selfish. Actually, it's simply natural and important for children to meet their need for power by controlling their things. Controlling things is a great way for them to do that, and way better than trying to control their parents, other kids, or grabbing other kids' things. Whenever possible, the desire to keep toys all to themselves should be allowed and protected, because when kids feel powerful and safe, they shift very quickly into generosity, which you can then point out as a STRENGTH. They need to know they are generous to be able to do it at will. We spent two weeks with family, including my daughter Janie, her 9-month-old cousin, and 3-year-old cousin Ben. My daughter grabbed Ben's face a number of times—mostly it was because (what I saw happening) he had come too close to her, and she felt threatened he was going to take what she was playing with away. He didn’t seem to notice her facial expression and body language, and initially she said ‘no,’ so this face grabbing thing started. How I responded: I told her it was wrong to grab Ben's face and pulled her away from the situation. Half of what I did was because that is what I felt was expected from me by my sister-in-law. How should I best react in future so that I’m not making my daughter or her cousin wrong or right, and also when I’m under the scrutiny of other parents? Many thanks for your ear & your time. 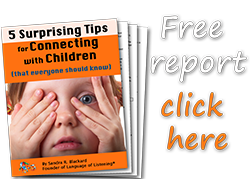 Glad you found my online SAY WHAT YOU SEE® handbook and are determined to learn how to use the simple coaching skills I teach. Your question is not unusual. Being on the child's side when setting a boundary can be difficult for parents new to my approach, since it requires a high level of comfort with the first step, SAY WHAT YOU SEE. Most of what you are seeking you will find in that step. Removing a 2 YO from a situation is not the wrong thing to do when a child continues a behavior you don't like, and you feel judged by other parents. And you are right that there is more that needs to happen to keep the situation from recurring—both kids need to feel understood and supported in finding solutions that work. You are probably right about your daughter's motivation in grabbing Ben's face—she thought he wanted to take her toys away. So, in the moment you described, you could reassure onlooking parents by putting yourself between your daughter and Ben, and then talking to each child in simple language to model how they can talk to each other respectfully in the future. Talking to the kids would also help you understand what Ben actually wanted. It doesn't sound like he wanted the toys, because since he is older he could have just grabbed them and run. What he wanted matters because you need to know what kids want before you can help them problem-solve. SWYS: "... and Ben came closer than you wanted. You thought he wanted your toys, and you said, 'No!'" SWYS: "Ben, she grabbed your face, and you didn't like that! It doesn't look like you want the toys." SWYS: "Ben, you want to play with Janie, and Janie, you want to play alone." CAN DO: "Hmm. Must be something you can do." CAN DO: "Ben thinks you can play together. Is that OK with you?" SWYS: "Ben, that won't work for Janie. Must be something else that will..."
Honoring each child's responses without trying to change them helps both kids feel heard and allows them to drop their resistance and sometimes change their minds. You never know where it will go. More times than not, when you protect a child's boundaries they feel safe and empowered and will actually invite other kids to play with them. I've seen it over and over with 2 and 3-year-olds, and it tickles me every time. SWYS: "Ben, she doesn't want to play yet." CAN DO: "You can ask later. Must be something you can do until she is ready." "Yet" is a powerful word that Donna Goertz often uses. It assumes the child will eventually want to play with others, which is true of all kids when they feel safe enough. This keeps Janie feeling good about herself, and gives Ben a tool for engaging with her next time—asking. With him, you could work closely to help him learn to read other kids' body language and master asking and waiting. As for Janie's face grabbing, it sounds like you are exactly right that it was an escalation when the socially acceptable tool she had been given (saying "no") didn't work. You could work with her to practice other things that would work. For starters, you could ask Ben what else Janie could do to let him know she doesn't want to play. If he comes up with something like, "She could say no three times," then have them practice it like a game with Janie saying no three times and Ben saying OK and running away. (Silly running would be great.) Have them do it over and over until they start giggling. Then the next time they get together, do it again, and the next time, and the next time, until they eventually master it. That's the kind of "Success Training" I do with kids that really works. Best Tip Ever for Sharing (This post is written for slightly older children, but you do the same with toddlers except you use counts instead of time for the CAN DO as in: "When can she have it? In one or three counts?" The key to saying what you see to kids without judgment lies in how you see them. From your comments I can tell you are already on your way to seeing Janie's true motivation, and none of it is ever bad. All behaviors and the things children want are driven by three healthy needs. The video workshops in my Online Training Center really get that point across. Plus the more confident you become in working with Janie and other kids, the more other parents will be inspired by you and pleasantly surprised, not critical.